If you notice that your child has trouble interacting with other children, responding to adults or seems overly shy, your child may benefit from activities that build social skills. 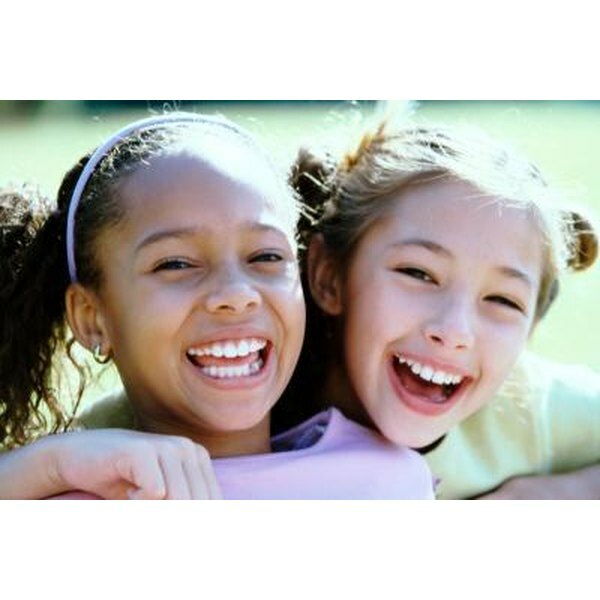 Children often learn social skills through experience and direction. Help your child enhance social skills by practicing at home and by providing ample opportunities for your youngster to play and connect with peers. Giving your child ample opportunities to play with other children her age is one of the best ways to exercise her social skills, notes the Department of Family and Child Development at Auburn University. While you can create activities and games at home that help to teach her to act, you cannot anticipate the words and actions of other children. Arrange for a closely monitored play group in your home, where you can see how your child interacts with others and where she needs to improve. Watching her with other children will tell you a great deal about her social skills. Role playing with your child to help him learn to effectively solve problems is an ideal way to teach him how to confront another child. Sit on the floor with him and act out various real-life scenes, like fighting over a toy, being called a name or asking to play. Instead of telling your child what to do in each scenario, ask him what he thinks he should do. It opens the discussion so you have a chance to talk about appropriate social behavior and problem solving, even with children who behave unacceptably. This, in turn, helps build your child's confidence when in social situations. Encouraging your child to talk about her feelings can help her understand and recognize her reactions to certain situations. Draw six or seven circles on a piece of paper and ask your child to fill in each circle with a face as you read a scenario. For instance, you might say, "Your friend calls you a mean name," and your child draw a sad face. Then, "Your friend shares a treat with you," and so on. Making sure that your child can correctly identify feelings can help her learn to deal with them through calming tactics or saying how she feels when with other children. Allowing your child to play a variety of games shoes him the importance of taking turns and following rules, suggests ParentingScience.com. Play games like "Follow the Leader," "Duck, Duck Goose" and "Tag." As you explain the rules, talk about the importance of letting other children have turns and following the rules without cheating. This teaches your child to successfully play with other children and how to be courteous when playing games with others.